NOTE: All spaces are filled but you may still signup to be placed on the cancellation list. Kick your songwriting muse into gear with fun exercises and discussion with other songwriters. For all levels — whether you’ve written many songs or are penning your first one. There’ll be an emphasis on writing sing alongs, especially songs of protest and hope. Bring your instrument and something for note taking. A piano will be provided. Jamie Anderson loves being a full time music teacher who offers instruction in songwriting and on several instruments. 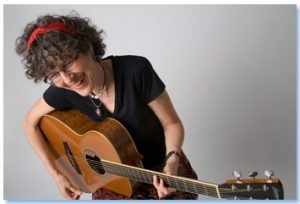 She taught herself to play the guitar more than forty years ago and went on to tour nationally in the US. Jamie’s taught for 17 years including private lessons in her Ottawa studio, at Duke University, for the city of Ottawa, and many music festivals and camps. There are only 20 spaces (first come, first served) but we will collect a cancellation list once the event is filled. Send an email to Patricia at patricia.reynolds@carleton.ca.